I never thought I would actually get married. I really didn't think I could find someone willing to put up with me. We actually had 2 weddings, the legal wedding with the two of us, a pastor and 2 close friends - nice and intimate. The second was a week later, it was the "big" wedding with the beautiful dress and our family and friends. 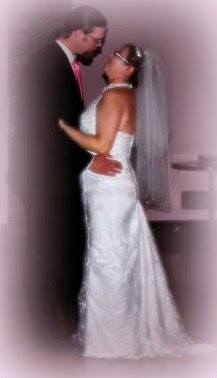 Both my hubby and I never had cold feet or questioned anything the closer the big day came - it just felt right. Once we were married nothing changed, which is good. We think it shows we have a loving stable relationship. I am so thankful my husband came into my life. He has taught me so much. I can't wait to spend forever with him! One year down, forever to go!